Just so you don't think I wasted my day, this is what I was up to today. Looks like a pile of firewood doesn't it? But it is really diamonds in the rough. This wood comes from a friend's property in South Central Alaska, it is a stand of genetically unique Baltic (White) Birch. In the cut ends of the large logs on the near end of the wood pile, you can see unique and distinctive heartwood grain figure, which in cross section resembles a rose. This is amazing material, similar in hardness to old growth maple. 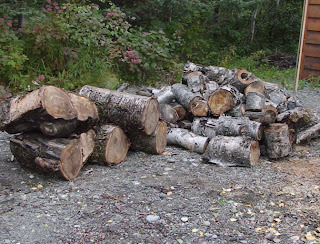 If you're not a woodworker it may be hard to visualize these logs as anything other than firewood, so here's a couple of pictures of what it looks like after I've pushed the wood through my shop. The first picture is a pair of heartwood bowls with some of the softwood removed in interesting patterns along the grain line. The exterior of each bowl is textured in curved bas relief, again along the concentric gain lines. Both bowls are finished with walnut oil and coated in a glossy polycrilyc, giving them a glass-like finish. They are not intended to be practical containers, they are art. With a devotional candle (safely inside a candle glass) inserted inside, they radiate yellow light in organic patterns. And finally, this dish, with filigree carving around the rim, is turned from sapwood (the lighter wood surrounding the heartwood inside of the bark. The filigree is cut with a Foredom tool using a fine carbide rotary bit. Like the bowls above, this one is finished with oil and polycrylic. See? and you thought I was wasting my retirement. Ha! Note: you can click on each picture for a larger image. Go on, do it, you know you want to. Neato. :) I really like that dish. How much do you sell them for? 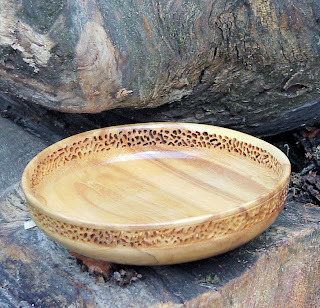 I like the heartwood bowls...and I'm still waiting for you to tell me how to purchase one, you big slacker. Seriously, that's nice stuff, man. And birch as hard as old growth maple, that's something. It has to do with the environment, Steve. In deep woods, birch grows slowly, making it very hard. Birch in open areas tends to be softer and much less interesting. It has to do with the amount of light the tree gets during the growing season. I'm currently constructing china cabinets from birch. The planks were rough cut from deep woods birch, the wood works exactly like maple. And the grain and figure are fantastic. how beautiful! I don't know what's more amazing-the wood itself or your ability to coax such incredible things from it. I don't know what's more amazing-the wood itself or your ability to coax such incredible things from it. Oh, it's definitely my abilities, MelissaKate. Simply gorgeous! Great art of any kind makes the viewer step back and think for a moment. 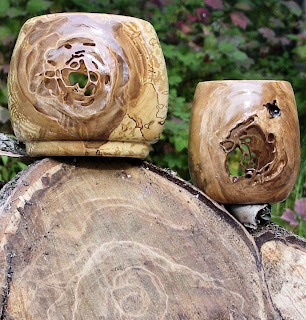 Your woodturnings have the added benefit of making the viewer say "Wow".